For Sean Alexander, faith has always been a family affair. Growing up under the heavy influence of his grandmother and attending a local Methodist Church every Sunday with his family, Sean could never imagine worshipping God without his family. When he married his wife, Hayln, and graduated from college in 1994, they continued the tradition of attending church first as a couple and then with their son in tow. Over the course of ten years, they attended many churches including Baptist, Christian and Missionary Alliance, Church of God and Brethren in Christ. By 2001, the couple returned to Jersey Shore and attended a very energetic church there. With a worship leader and a band, the experience was very lively and entertaining. Hayln, however, began to feel that something was missing from all the song and dance. She and Sean both agreed that while the services showed them a good time, it wasn’t about God. It was about having a good time in church. Hayln’s mother attended a small Orthodox Church in keeping with her father’s faith. 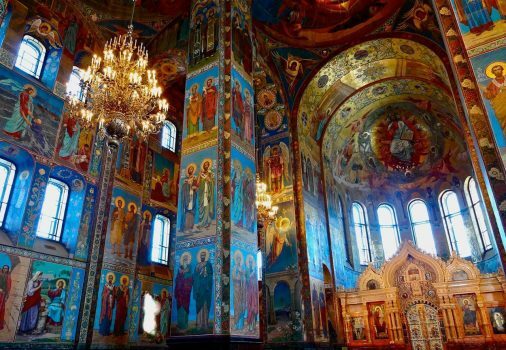 She didn’t talk much about it except to say that the Orthodox Church was like coming home. Hayln and Sean left the Church of God and searched for smaller churches in the hopes of finding one where the services would be more reverent and help them both to grow spiritually. Hayln began to attend Bible studies with her mother and soon attended services at Holy Cross Orthodox church. With Easter and Pascha coming over two weekends, she and Sean participated in both celebrations. While Hayln began to embrace the Orthodox faith, Sean was dismayed to discover the late start to the Pascha services, that it would last for three hours and he would have to mind their son. The services also felt too Roman Catholic for him and this did not sit well with him. For a time afterwards, he and Hayln attended separate churches. Hayln was firm in her decision to attend the Orthodox Church while Sean needed more convincing. After a while, the separation took its toll. Instead of worshipping together as a family, Sean went to his church angry over the separation and Hayln went to church in tears. Sean finally decided that he would attend services at Holy Cross with the intention of finding something wrong to point out to his wife and then they could leave to find a “real” church. Little did he know, he would be the one proven wrong. For the first few weeks, Sean attended Holy Cross in body more so than in spirit. He would often sneak out of services with his son to hang out at a nearby creek. Eventually, he did start to pay more attention to the Liturgy and found himself with many questions. He approached the priest, Father Dan, in the hopes of receiving the answer that would allow his family to leave the Orthodox Church and finally move on. If anything, the answers he received only gave him more reasons to stay. 2005, the Alexander family was baptized and chrismated into Holy Cross Church. It was the first time they received the Eucharist in years and it was a special and symbolic moment. Despite all the change that they went through as a family, it brought them to the Church that never changes.